...and Resell Immediately for Huge Profits! buying a tax lien or attending a tax deed auction! Almost everyone knows about pre-foreclosure investing...you look up mortgage foreclosure filings, contact the owner before the property is auctioned off, and make a sweet deal with the distressed owner. The problem? All of the properties have a mortgage on them! The very situation that causes the owner motivation becomes our problem if we get involved with the property. And with the recent dive in real estate prices, a great majority of mortgaged properties in foreclosure are upside-down (the property isn't even worth what's owed). You can't make money even if the owner gives you the property for free. If you manage to find a property with equity and set up a deal, you'll then need thousands of dollars to make up the back payments, and you'll have to continue dealing with the mortgage. Or you'll have to pay off the mortgage in full. Mortgage pre-foreclosure investing has been a standard method taught in real estate seminars and books for over 25 years - so there is a virtual army of investors who are fighting over the scraps of equity that are there. Some owners in mortgage foreclosure get over 50 letters from investors when their bank starts the foreclosure process. But Foreclosure Is Where To Find Motivated Sellers, Right? High-profit deals usually require a very motivated seller, and nothing motivates a seller like an upcoming foreclosure. But today, few sellers in mortgage foreclosure have any equity. What if there was a group of owners who were about to lose their property to foreclosure, but many of their properties had no mortgage? How could someone lose a property to foreclosure if they don't have a mortgage? It turns out that a property can be foreclosed for the non-payment of property taxes as well. Fact: Most banks don't allow mortgaged property to enter tax delinquency - they pay off delinquent taxes as they become due. So most tax foreclosure properties don't have a mortgage. Tax Foreclosure - Where Unwanted Property "Goes to Die"
Or, they just don't have the money to pay the taxes. In any case, when the headache of paying taxes year after year on a property becomes too much, a certain percentage of owners simply quit paying. And the property heads down the path to tax foreclosure. Investing Tip: If you attend tax auctions to purchase property, you'll be bidding against many other investors. Properties are often bid up to near retail value. If you buy tax liens, you'll have to wait months or years to acquire property, because the owner is given a chance to pay you off. 95% of the time you'll be paid off before you can get a deed to the property. Most Tax Preforeclosure Properties Are "Free and Clear"
Mortgaged property seldom goes into tax delinquency. Why? A mortgage is wiped out when a tax foreclosure occurs. So, the mortgage company pays the taxes on behalf of the delinquent owner to keep the mortgage intact. This means there is incredible equity in many tax sale properties - often, delinquent taxes are the only debt against the property. This creates the perfect investing opportunity: lots of free and clear properties with ultra-motivated owners facing foreclosure. Over five years ago, I sent my first letters to owners facing tax foreclosure. I expected the same cold response to the mortgage foreclosure letters I had sent in the past. I got lots of calls from my letters, and most people were happy to hear from me! I could just resell the properties to rehabbers and avoid fixup and landlording hassles! Contrast this with owners in mortgage foreclosure, most of whom are desperately trying to save their home, and don't want to sell. A "Thorn in the Side" of Tax Auction/Tax Lien Buyers? I've annoyed some tax auction bidders and tax lien holders, by taking properties out of their clutches before the final deadline to pay the delinquent taxes. I've dealt with the owner directly to buy the property right before the deadline, and the tax investors find their lien paid off, or the property removed from the upcoming auction. They began calling me "DeedGrabber" and the name just stuck. DeedGrabbing has been the main focus of my business ever since I sent that first batch of letters out. 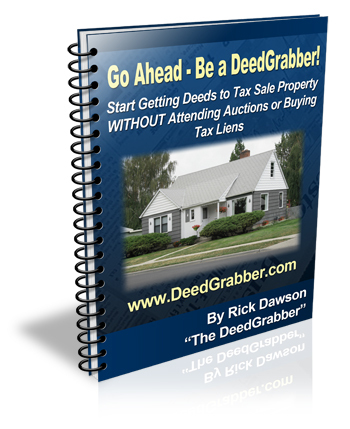 And there are so many tax delinquent properties in the system, I've decided to make my system available to everyone - with the "Go Ahead, Be a DeedGrabber" Ebook! Now you can quickly learn how to get these "underground lists" of tax delinquent and tax auction properties right from your local taxing authority. Then begin buying properties for $200, $100, or even $50, directly from the owners, and reselling them for huge profits! "20 Phone Calls from 100 Letters - and 3 Potential Deals"
"I cannot tell you how helpful your course was. I have been doing what you suggested over the past 3 weeks and I have sent out about 100 letters. I received about 20 phone calls back and of that, I have three really (potentially) great opportunities. Vacant properties, in decent shape with out of town owners. One person just said 'make me an offer'! Hopefully, at least one of these three deals will be a great success for my wife and I." Update: Bill has purchased 3 properties and gained a combined equity of $150,000! Just by taking the time to send 100 letters, Bill is already working on 3 deals, and finding exasperated owners who just want to rid themselves of their delinquent property. And this is not unusual - we buy properties for token amounts like $50, $200, or even $10 every month. And we can often wait to pay the delinquent taxes until we resell the property! Why do some owners sell for token amounts? They've already decided to let the property go to tax auction, and aren't expecting to realize any money from it. So it's not difficult to take the property off their hands in exchange for enough money to treat the family to a nice dinner! In fact, we've given the owner closure early, and they're often thankful. Getting "once-in-a-lifetime" deals every month is no longer something you can only dream about. Once you get your hands on my training, you too can have motivated sellers calling you, practically begging you to take their property! "Go Ahead - Be a DeedGrabber!" The proper way to research any property, anywhere, after you've made a deal with the owner. What to do with the property you acquire, and more! Everything you need to get started now, is here. claim to show you how to make quick profits attending tax sales. Unless you have lots of cash you want to invest long-term on tax liens, or you want to bid against many others at tax deed sales, buying from owners before the tax sale deadline is the only way to make reliable, quick cash with tax sales. For the first 60 days you own the ebook, put it to use. And if you have any questions along the way, email us! My staff and I have encountered almost every situation with DeedGrabbing and can quickly get you on track if you need assistance. What do experienced tax sale buyers say about my DeedGrabbing system? "I Spent Years Trying to Get Property from Tax Sale Until I Got my Hands on Rick's Infomation"
"I bought thousands of dollars worth of tax liens over the last 10 years and was always paid off - I never got a deed to a single property - until I got my hands on Rick's information!Rick could (and should) charge a lot more! If it's your goal to get deeds to tax sale property, don't invest at sales - START HERE!" Simply put...Once you pursue the strategies found in the "Go Ahead - Be a DeedGrabber" ebook, combined with these powerful bonuses, it will be virtually impossible for you to fail at buying cheap properties from tax-delinquent owners. Today is the day that you make a change for the better. Here's what you need to do now. 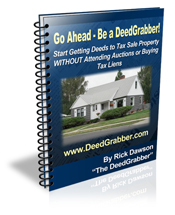 Get the DeedGrabber Ebook, and quickly learn how to obtain lists of tax delinquent properties in your area. Then, contact the owners and get unwanted property for as little as $50 - even $10. Use your 60-day email support for any questions, or to work with us on your deals. If you're not completely satisfied with my system for any reason at all within 30 days, just send me an email and I'll send you a refund in FULL. You can have it all for just $59 if you act NOW! I understand	that my order will be processed on Infusionsoft's 100% secure order form and I will be downloading the entire 122 page e-book in PDF format just a few minutes from now. Yes! Even if it's 2:00 in the morning! It's easy to get started, just click the link above and you'll be underway in a matter of minutes! - Remember, when you say yes to the "Go Ahead, Be a DeedGrabber" training, it’s proven to work, so you have nothing to lose. I know you’re tired of wondering how to make money in real estate,hoping and praying that you can get deals like you see on TV. You can, just not the way they teach you!